Last updated on July 28, 2015 April 25, 2018 by Daniel Waldron for Armagard Ltd. Outdoor TVs are becoming a popular item in both home and businesses. Many pubs, bars and restaurants are installing them to entertain customers in outdoor locations, largely brought about due to the smoking ban. 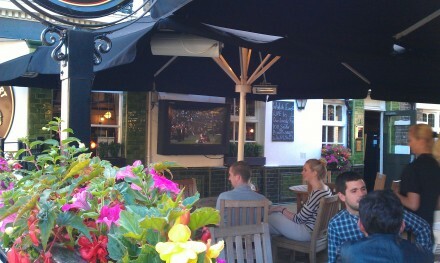 Outdoor TV installation is a growing trend across pubs and bars. Homeowners are installing them in patios, barbeque areas and back yards as more and more people take to outdoor living. Installing a TV in an outdoor location does come with several problems, though. The weather is one of the main concerns as water and electrical appliances like TVs do not mix, but there are other considerations too. Physical protection is something that also needs to be considered. An outdoor screen is in a vulnerable position, and unless you want to keep transporting it indoors after use, it will have to be secure enough to prevent theft and vandalism. For an all-year-round outdoor TV, the temperature needs to be considered too. An LCD TV left outdoors permanently is subject to the heat of summer and the extreme cold of winter both of which can cause problems if the device overheats or condensation freezes inside the TV. Sunlight is another factor that can often cause problems for outdoor TV use. Direct sunlight will cause glare, making the screen unreadable and can increase the likelihood of overheating while very bright sunshine will also make it difficult to see the screen. High brightness screens and anti-glare glass can overcome these viewing difficulties, but they do not prevent the overheating issues. 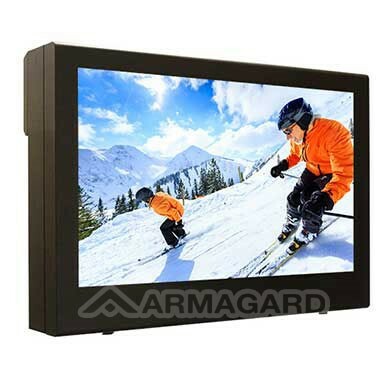 The Armagard, high-bright outdoor TV enclosure helps to combat issues such as screen glare and overheating. Not only do these steel TV cabinets protect an LCD TV from the weather, dust and other outdoor elements they also have a temperature controlled environment inside the enclosure to prevent overheating (and freezing in cold conditions). They also protect the device from theft and vandalism as they are manufactured from steel and can be mounted on a wall bracket or other secure mount. Furthermore, LCD enclosures can protect standard TV devices in outdoor locations, which means there is no need to spend money on highly expensive waterproof and all weather devices as almost any flat panel device – either one bought or a spare TV taken from the home – can be installed inside the enclosure. This entry is filed under Outdoor TV. You can follow any responses to this entry through the RSS 2.0 feed. Both comments and pings are currently closed.